Today, emails have replaced conventional mail, and are very important to us all. But we find that the number of emails we receive daily is so large that just having a look at them, and sorting the ones we want and need, is an onerous talk, and eats away a lot of our precious time, that we could have used more productively. We receive emails in the form of newsletters, notifications from different persons, organisations and from social networking sites, which could or could not be useful for us. But we lose our productive time while going through so many emails. Gmail has a built-in feature called “Priority Inbox” which enables us to keep a quick watch on useful emails. If there could be a system or feature, where the mail service could automatically organise some emails as less important – which were important to us at some point of time, but today they are less important, then we could save a lot of time, which we spend organizing them. Like if we have got a job, the mail related to a new job opening may become less important to us. Here come OtherInbox, a free third-party service which helps keep our inbox less heavy, and keeps out all the unimportant emails, and puts them in separate folders. Setting up OtherInbox is not at all difficult, and will take only some mouse clicks to get it working. Go to OtherInbox Organiser page and sign up. It is currently available for AOL, Gmail, Yahoo and iCloud. More services are expected to be added in future. 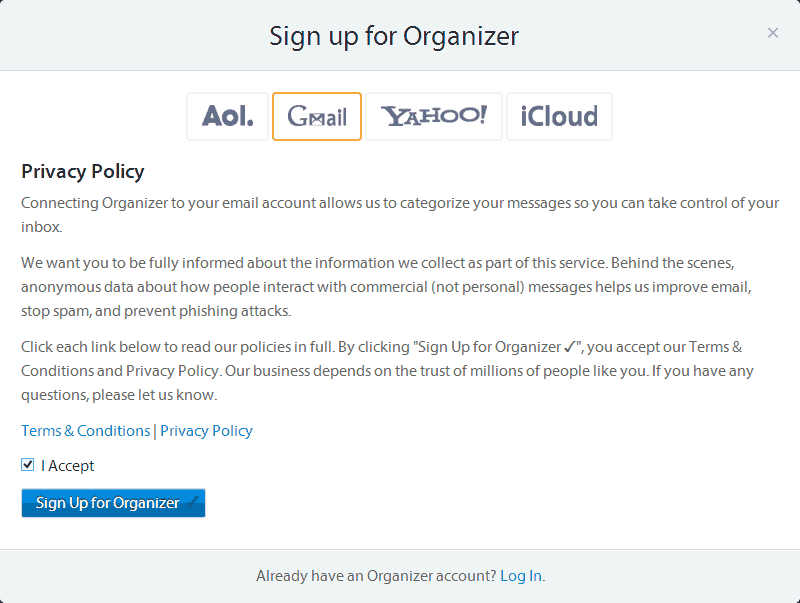 Now select your email provider and accept OtherInbox’s terms. Now we need to authenticate OtherInbox Organiser’s access to our inbox. After this OtherInbox becomes operational and starts scanning all the emails, and sorting them in different folders. Now we can sit back in comfort, and OtherInbox will sort out all the emails into different folders automatically. It organizes all the present mail and takes care of future emails too. The goal of OtherInbox is to make use of email service better for all. Here OtherInbox helps us to be the master, and not a slave to email system. 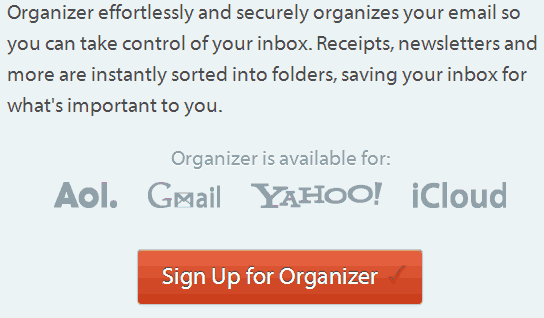 OtherInbox Organiser helps us in sorting all mails and putting them into different folders. This helps in making a quick assessment of the emails, and discard unwanted mails, and also give more time to the wanted ones. Thus the cleaning is quick. OtherInbox is currently available for popular email services like Gmail, Yahoo, AOL and iCloud. It categorises emails based on the different domains it came from and arrange them into different folders, like Business, Travel, Health, Wealth, Social Networking, Education, Employment, etc. It also allows you to change their default categories and add your own. You can also alter the automatic organizing of emails and customize the folders different emails go to. All those emails that do not need your attention be deleted. All those emails where no reply is required to be sent, be either deleted or kept separate. If an email is important and needs action, act on it. And all of this is easily achieved by OtherInbox. Today we cannot think of our life without email, but getting too many mails which do not merit our attention, makes the job of looking into emails boring and tiresome. It is here that OtherInbox Organiser comes to our rescue and makes our life comfortable. 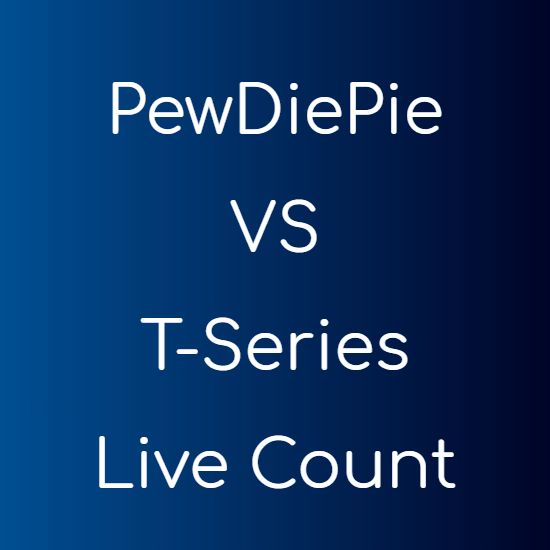 After all we have only 24 hours in a day and that cannot be increased.